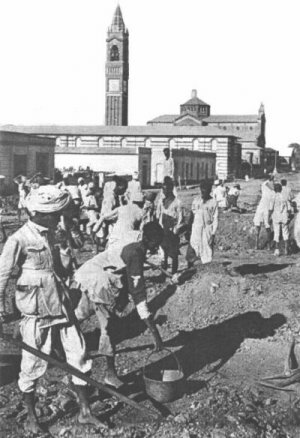 After centuries of existence as a poor obscure village, Asmara is now being rebuilt, enlarged and made into an up-to-date city. Travelers, arriving in the town over the new railroad from Massaua find its cool climate a pleasant respite from the steaming hot atmosphere at sea level. A modern hotel, shops, and glittering official life make it the busy center of Italian rule in Eritrea. A tall bell tower rises above the capital's largest church in the background.